Human medications, including albuterol inhalers, are among the most common poisoning hazards that pets face. To you, these medications are vital to maintaining your health. To your dog or cat, they are potential for fun and food, but they are also very toxic. It is extremely important that every household with animals keeps any medications well out of the reach of your curious furry friends. Every day, the Pet Poison Helpline receives calls about pets getting into their owner’s medications. These include pills and they don't need to be prescriptions, either. The helpline ranks over-the-counter pain relievers like Advil and Tylenol in the top two spots on their list of top 10 human medications poisonous to pets. According to the helpline, almost 50 percent of pet poisonings involve human medications. It may be as simple as dropping an aspirin on the floor without realizing it. Then again, your pup may chew an abandoned pill bottle open to reach the "treats" that rattle inside. Any of these can be toxic to animals and have the potential to be fatal. For these reasons, it's vital that everyone in your family pays attention to safe handling and storage of all medications. One medication that is particularly concerning is albuterol inhalers. Dogs will chew on the inhaler and, upon puncturing it, receive a very large dose of albuterol all at once. This massive dose causes toxicity by elevating the heart rate to life-threatening levels. It also causes very low potassium levels in the blood which, in turn, lead to extreme weakness, incoordination, and, potentially, death. Other signs which are often seen in dogs who puncture albuterol inhalers include vomiting, dilated pupils, severe agitation/hyperactivity, elevated blood pressure, and vomiting. 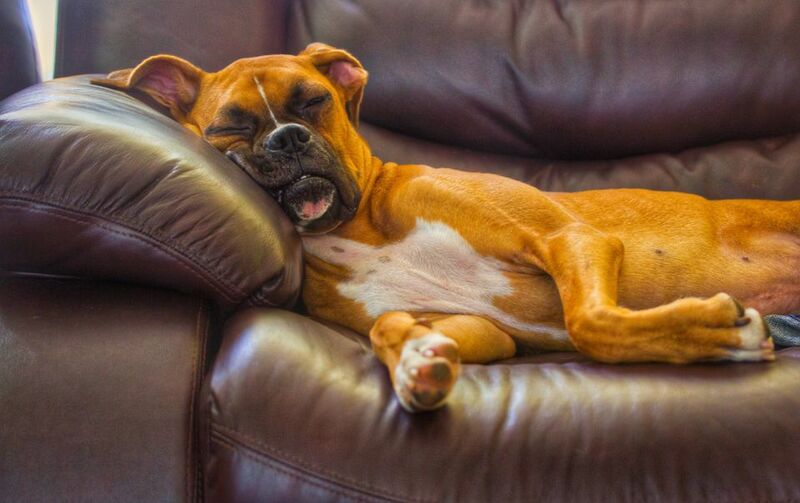 Rooney, a 4-year-old healthy male boxer, was caught chewing on and puncturing his owner’s albuterol inhaler. Within 10 minutes he had vomited twice and seemed very nervous. He then began to have difficulty walking and seemed very weak. When his owners went to pick him up off the floor, they felt his heart racing. Realizing this was an emergency, they immediately rushed Rooney to his veterinarian. When Rooney arrived at the hospital, he was unable to walk, panting severely, and had developed an irregular heart rhythm. His heart rate was very rapid at over 240 beats per minute (normal is up to 130 to 150 beats per minute). The veterinarian performed blood tests and found that Rooney’s blood potassium level was below 2.0 (normal is 3.5 to 6.0; any amount below 2.5 is considered life-threatening). Because of this low potassium level and high heart rate, Rooney was extremely weak and needed emergency intervention. His veterinarian immediately gave him intravenous potassium and beta-blockers to slow his heart rate. Within 30 minutes, Rooney had improved dramatically and was able to stand on his own. He was placed on a steady rate of intravenous potassium and given more beta-blockers over the course of the night. By the next morning, Rooney was doing so well that he no longer needed extra potassium or heart medications. He was able to go home later that day. Rooney's case is very typical of the albuterol inhaler cases that Pet Poison Helpline receives calls about. Thankfully, when treated appropriately, many dogs survive albuterol poisoning. However, if left untreated, dogs may die as a result of cardiac arrhythmias and too-low potassium levels. This case is typical of the quick progression of any pet poisoning, no matter the drug. If your pet ingests a human medication always call your veterinarian immediately. The sooner treatment is sought for your pet, the better the prognosis. There may be times when you are not aware that your pet ingested a medication. It is not uncommon for pet owners to notice the symptoms of a poisoning before discovering the cause, such as a punctured inhaler or empty pill bottle. The problem is that there is not a single sign or symptom that you can look for. However, because you know your pet's behavior, you can also tell when something's not right. Common signs that your pet has been poisoned by something—medications or other toxins—include vomiting, diarrhea, bloody stool or urine, or a loss of appetite. These are likely to come on suddenly as the toxin works its way through the body. The symptoms will also vary based on the type of poison and the size of the animal. Small animals will be affected more quickly and with greater severity than larger animals, for instance. With some poisons, animals may also become lethargic or agitated. Seizures, tremors, abnormal breathing, and a change in blood pressure and heart rate also indicate your pet is very sick. It's possible that your dog or cat exhibits these symptoms without having been poisoned. There are many other medical conditions that share these signs of illness. No matter what, if you notice any of the above symptoms or anything unusual, you need to call your veterinarian right away because it is a potential emergency. Only your vet knows your pet's medical history. By telling them what you're observing, they can better tell you if it's an emergency or something that can wait for the next available appointment. When in doubt, call the vet. There are a number of things pet owners can do to prevent medication poisoning. Taking these steps will help ensure your pets are safe in your home. Do not place pet medications next to human medications. It's too easy to mix them up and accidentally give a cat or dog a toxic dose of the wrong pill. Store medications in a secure cabinet that is out of the reach of pets. This includes cats who may climb on bathroom vanities and have fun knocking pill bottles to the floor. Hang up purses and bags that have medications. If you carry aspirin or prescriptions in your purse or your child stores an inhaler in a backpack, make sure to hang these out of reach of your pets. Animals are curious and may dig around in a bag looking for something to play with or eat. Pick up any dropped pills right away. Accidents happen and sometimes pills get spilled onto the counter or floor. Be thorough and ensure you pick up every last one before your pets discover them. Ahna Brutlag, DVM serves as Director, Veterinary Services & Senior Veterinary Toxicologist for the Pet Poison Helpline, a division of SafetyCall International. Pet Poison Helpline. Top 10 Human Medications Poisonous to Pets. 2018. Huyck P. What Are the Signs of Poisoning? Pet Poison Helpline. 2014. Should You Make Your Dog Vomit if He Got Into Poison?